Language learning, from grade school to high school. With Mango, you'll learn vocabulary, pronunciation, grammar, and culture all in one integrated experience. There's a lot under the hood, but it's deliciously simple on the surface. Keep a language-learning transcript to stay ready for your kiddo's next step. We know each state has its own way of measuring your student’s progress, so we’ve got you covered down to the minute. You don’t need to be an expert in Azerbaijani to know if your student’s getting it. Mango’s powerful assessment feature takes care of that for you. 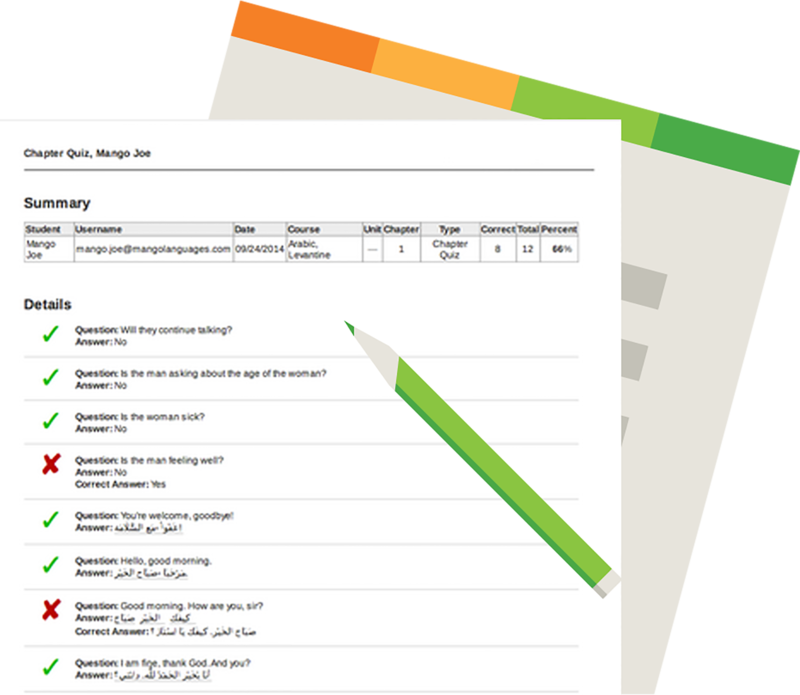 Check out printable grade books to see how your little one is progressing. Not enough time in the classroom? Have your students learn on their mobile phone or tablet while you take care of business. IMPORTANT: Your credit card won't be charged until your trial has ended. You can cancel at any time.